Large groups of motorcycle and ATV riders have already been spotted on the streets of Miami days ahead of the Martin Luther King Day protest against gun violence. The annual, unsanctioned event has spilled over into random rides throughout the year, often creating dangerous situations when riders speed, weave in and out of traffic, and perform stunts. Last month, Miami Beach Police temporarily blocked entrances to the Beach when one group of riders was headed here. 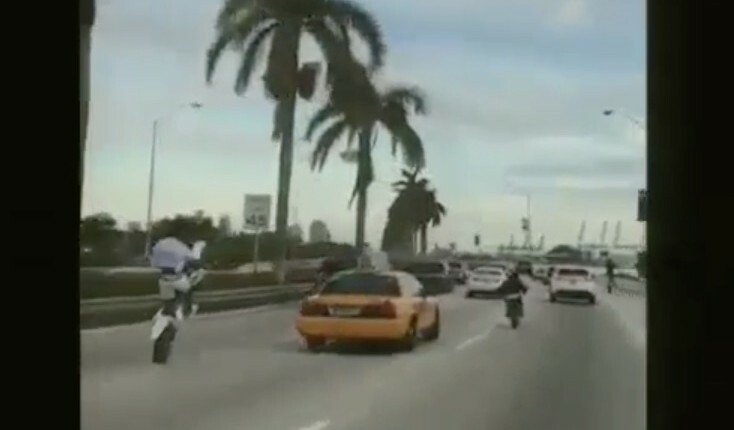 That tactic doesn’t work all the time according to Miami Beach Police Chief Dan Oates as police don’t always know when and where the riders will take to the streets. “If we have enough advance warning we will do everything within our capacity to prevent these folks from getting on the Beach,” he told RE:MiamiBeach. “The one day that we interdicted them, we knew where they were starting,” he said referring to the temporary closure of entrances to the City. Prior to that action Oates participated in a meeting of police chiefs in Miami-Dade to discuss the increasingly dangerous and more frequent rides. Earlier this week, several law enforcement agencies in Miami-Dade and Broward Counties issued warnings to riders that there would be zero tolerance of illegal activities. WVSN 7 News reported last night two arrests were made in Northwest Miami-Dade after two men were spotted using off-road vehicles illegally. Their report indicated one of the men was carrying a stolen weapon, the other was carrying a concealed weapon without a permit.